Our kids are just getting to the board game age, so we generally try to keep things simple when it comes to board games. Snakes & Ladders is a perennial favourite, but the latest one that's getting all the love in this house is Tetris Dual. It involves lots of creative spatial thinking to fit the odd-shaped pieces together, just like in the old arcade game we all know. It's a two player game with a simple electronic display to keep tally of points & whose turn it is. The kids actually had a lot of fun playing with it in their own way, trying to stack all the pieces in the board, one at a time & fill it perfectly without any gaps. Though I love the original video game version of Tetris, I prefer this one for my kids. They can play at their own speed & work on actual hand-eye-coordination & fine motor skills using their hands, rather than just clicking or tapping a screen. A bonus for my son is that the game pieces are his two favourite colours: orange & turquoise! 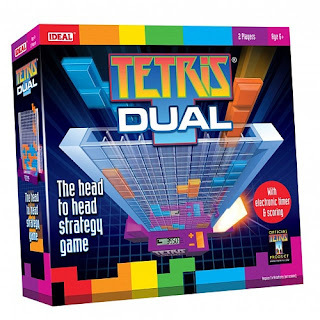 Tetris Dual is great for kids aged 6-10. It generally retails for around $30 in Canada. If you're interested in finding out more about Tetris Dual, or some other fun board games to amp up your family games night, check out Kroeger Games Night! Kroeger will be hosting a Facebook party & GIVEAWAY on Friday, December 1 from 7:00pm - 8:00pm EST & they would love to have you participate! During the Kroeger Games Night & Facebook Party they will be answering questions, sharing fun facts, showing games night photos & more! So head over to like Kroeger's Facebook page & pop by Friday afternoon/evening for the party. Disclaimer: I was given copies of the above game to facilitate this review. I was not financially compensated for writing this post. All the words & opinions above are my own.